Today I'll be devoting myself to two movies and two movies only. 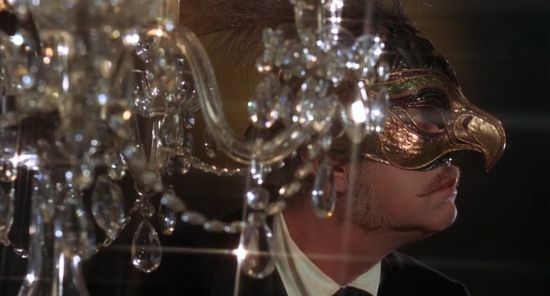 The Abominable Dr. Phibes and Dr. Phibes Rises Again!, two delightful camp-horror films from the early 1970s starring Vincent Price. These movies are 100% awesome. This movie is a goddamn masterpiece. A beautiful, British, early-70s, art-deco, camp masterpiece. Here's the setup. 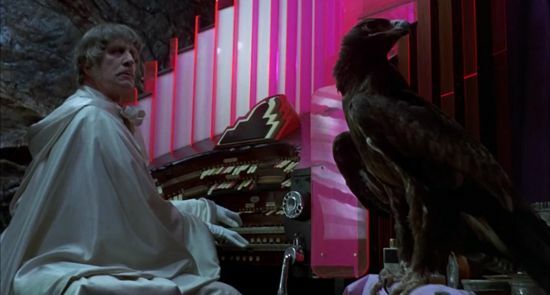 Vincent Price plays Dr. Anton Phibes, a brilliant doctor and professional concert organist. While abroad, his wife took ill and required emergency surgery. While speeding to her side, his car went over a cliff and caught fire. 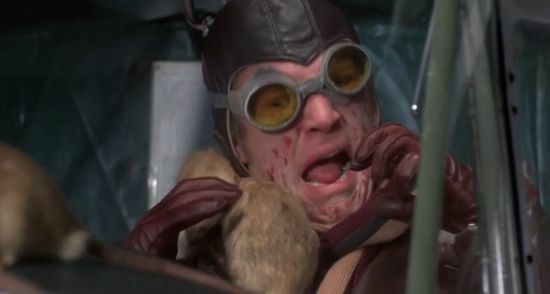 His wife died on the operating table, under the scalpel of a doctor played fantastically by Joseph Cotten. 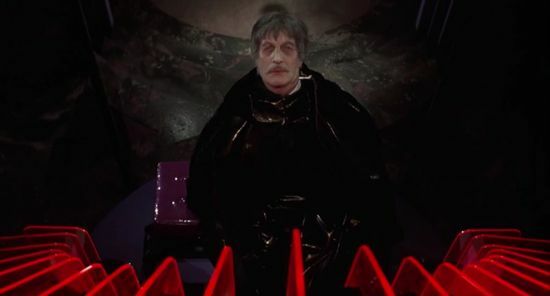 Everyone thinks Dr. Phibes is dead, but that's not true. He was just horribly disfigured. And now he's back for revenge, planning to kill Dr. Vesalius (played by Cotten) and the eight other doctors who had a hand in what he views as his wife's murder. His methods, of course, will all incorporate the ten plagues of Egypt, from the Bible. 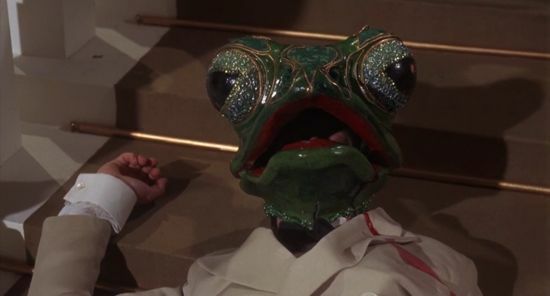 So this guy, for example, is slowly strangled by a frog mask, until he barfs blood and falls down some stairs. 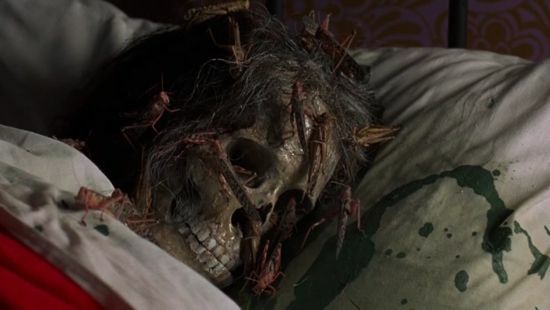 Everything's coming up roses for Dr. Phibes. He slowly works his way through the other doctors. I can't show you all of them, although I want to. He kills one with bees, one with blood, one with beasts. When the plane crashes into a horrible fireball, he twirls his telescope and applauds, while his beautiful assistant Vulnavia plays the violin. You know, just like you or I would do. 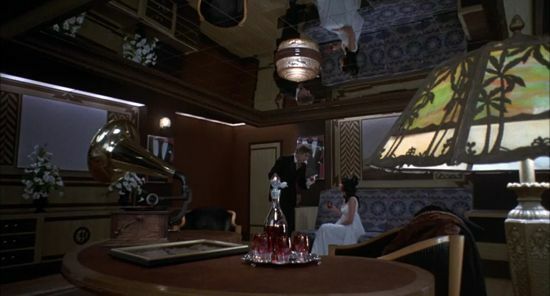 The sets, wardrobe, and composition of this movie are incredible. The production went balls-out on the art-deco. 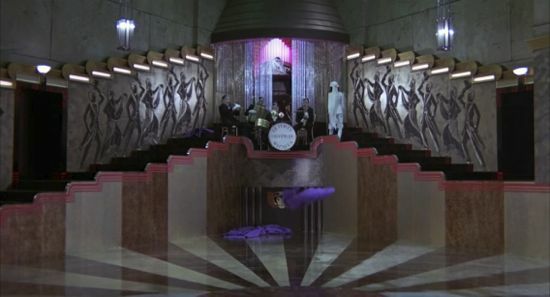 It's set in the late 1920s, and they spared no expense to make it look as grandiose and ornate as possible. 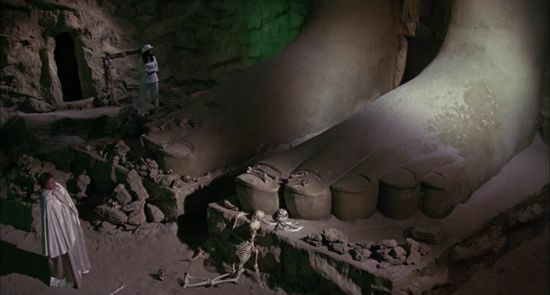 And Vincent Price is INCREDIBLE in this movie. 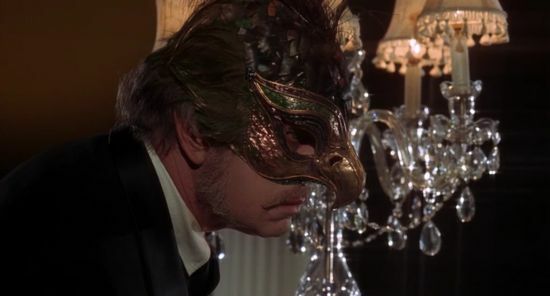 Dr. Phibes' actual face is super-messed-up, and the "Vincent Price" face is just bits of latex prosthesis spirit gummed onto his charred skull, basically. He can't use his mouth to speak-- or do anything else. So there are hilarious shots of him eating and drinking by putting the spoon or glass around to the back of his neck. And because he can't speak normally, he's lucky he was a genius at electronic music. He rigs up a methodology by which he can plug a quarter-inch phono jack into his neck and speak through an old-school Victrola horn. While his dialogue plays onscreen, Price does his absolute best to mimic speaking the dialogue while keeping his mouth closed, which is hilarious and creepy at the same time. The murder methods are Rube Goldberg affairs in some cases, gruesome little mini-adventures, and the promise of their impending display kept me on the edge of my seat, while the sets and framing of the shots kept me dazzled. This one doesn't make quite as much sense. 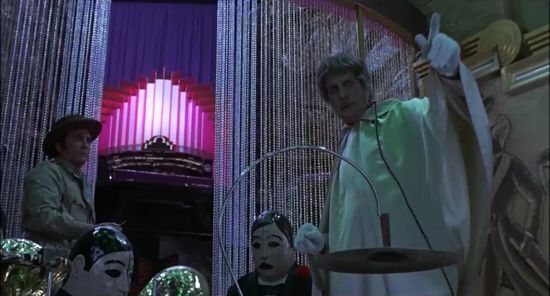 In the first movie, Dr. Phibes is out for revenge. In this one, there's some cockeyed scheme about a magical river in Egypt that can bring his wife back to life, and grant him immortality. 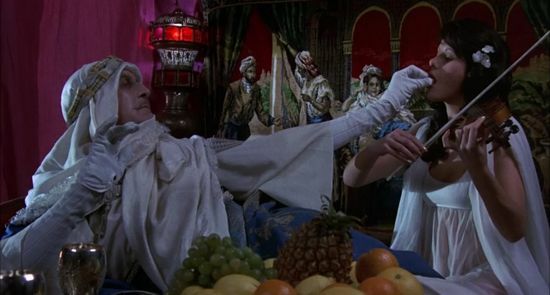 Instead of a doctor struggling for survival against Phibes, there's a centuries-old man desperate to retain his youth and bring his wife along so she can also live forever. 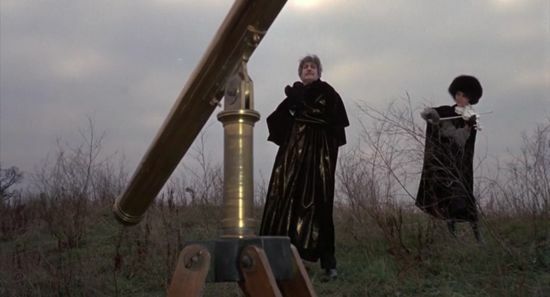 Phibes' foe has a number of hired hands and lackeys that Phibes is given the opportunity to kill, but it seems much more like he's doing it for the sheer joy of murder than out of the righteous fury he displayed in the first movie. Which is fine, because the murders are still hilarious and awesome. Also, the first one was apparently enough of a hit to justify boosting the budget for this one. 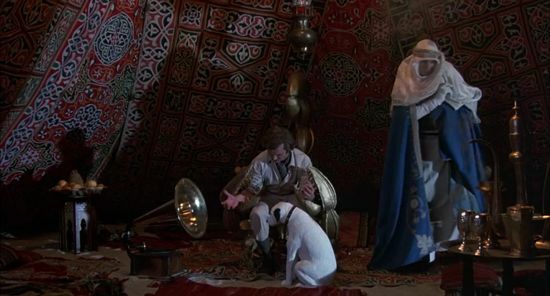 What it lacks in intelligent plot and character motivations, it more than makes up for in design, ostentatious costumery, and over-the-top sets. These movies are so much fun. This is just an excuse for me to post more awesome screenshots. You should check these movies out.